The Emancipation Proclamation became official on January 1, 1863. Philadelphia’s black community celebrated Emancipation by crowding into the city’s black churches minutes before the New Year; at midnight, Philadelphians of color cheered the president’s proclamation. Dubin and Biddle, Tasting Freedom, 277-278. “Meetings and Demonstrations,” The Christian Recorder, January 10, 1863. Like most diarists, Emilie regularly reports on the weather. Rain, snow, or extreme temperatures at times prevented her daily travels, as she travelled on foot to work, school, and church. 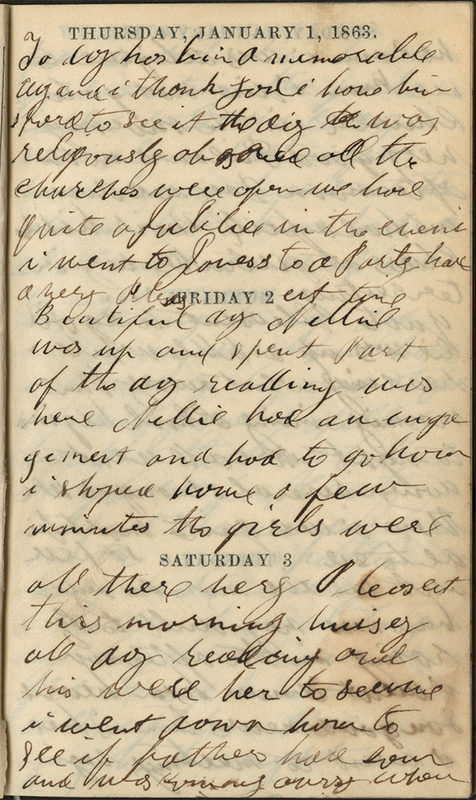 Nellie or Nel appears often in the diary. It is unclear to whom Emilie referred, but the annotation on February 20, 1863 provides a likely possibility. Emilie refers to a “reading” and “redding” in other entries; this is likely the same person. In 1860, Emilie Davis was twenty-one years old and living in the home of her uncle, Elijah Davis (EJ). Emilie’s occupation is listed as “servant” in the census, suggesting that her frequent references to sewing in the diary were related to her work as a domestic servant. Also resident in the home was Elijah’s wife Sarah Davis (twenty-eight years old in 1863) and the couple’s son, Elwood (four years old), Elizabeth Davis (nineteen years old) and Thomas Davis (fifteen years old). By 1863, Emilie appears to be living on her own. At times, she lives with employers on the outskirts of Philadelphia. Year: 1860; Census Place: Philadelphia Ward 7, Philadelphia, Pennsylvania; Roll: M653_1157; Page: 58; Image: 62; Family History Library Film: 805157. Census records suggest that Emilie Davis’ father is Isaac Davis, sixty-three in 1863, was living with Ann (thirty-seven years old), Levi (forty-four years old), and Levi, Jr. (fourteen years old) Frever — perhaps Isaac’s daughter, son-in-law, and grandson – in Harrisburg, Pennsylvania. Year: 1860; Census Place: Harrisburg Ward 4, Dauphin, Pennsylvania; Roll: M653_1104; Page: 1104; Image: 501; Family History Library Film: 805104.